Scheduler shows the events being performed, events being evaluated, and events with a pending date. 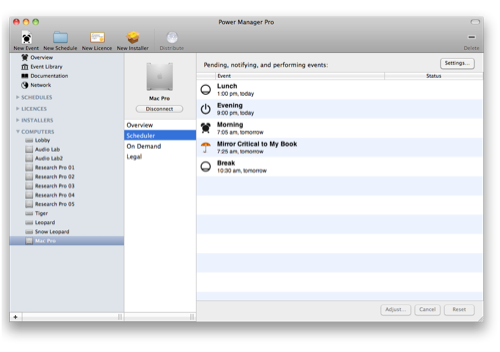 The events shown here mirror the events displayed in the Power Manager status menu bar. The events visible in the Scheduler are likely to be a subset of those visible in Overview. Only events whose trigger dates are know are visible. Events triggered by unpredictable triggers, such as inactivity, do not appear. Events with known trigger dates can be adjusted, cancelled, and reset. This individual control is powerful and a useful way of making one off changes to schedules. A typical example is to delay an event by half an hour because circumstances have changed. Scheduler provides access to the Notification Settings ( ). Power Manager's notification settings control when warnings and pending notifications are displayed. 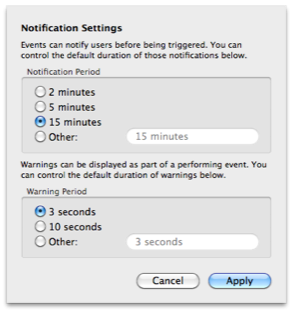 Notifications provide an opportunity for the Mac's user to react to the pending event. The Notification Period and Warning Period can be set to a range of standard choices, or set to any reasonable duration using a duration control. Individual event's notification behaviour can be changed by editing the event directly. The settings provided by Notification Settings are the default values, where no specific value is provided by the event. Navigate to the Computer's Scheduler. Select the event to adjust. Click on the Adjust… button. Enter the new date and time to trigger the event, and click on the Adjust button. Select the event to cancel. Select the event to reset.